Some 110 meters underwater off the coast of Xlendi Bay there lay, for centuries, an archaeological treasure that is now warming the cockles of archaeologists and historians. Unearthed in an expedition that was far from your ring-lost-in-the-sand search, the mesmerising shipwreck clasps intriguing artefacts dating back to 700 BC, knowing their origin to Phoenician traders. 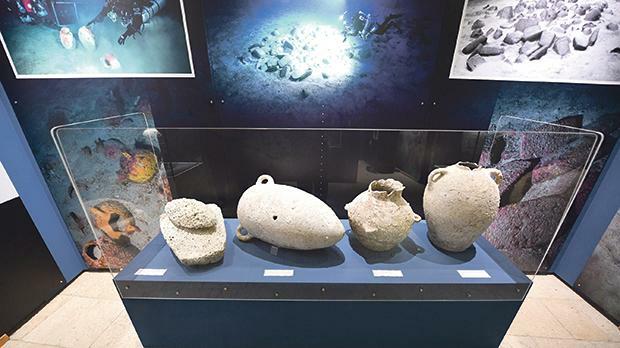 And for the first time on these islands, a selection of the artefacts – from what Heritage Malta describes as the oldest wreck ever found in this region – are on public display, at the Cittadella in Gozo. “This exhibition is another jewel in the Cittadella’s crown,” said Timmy Gambin, from the University of Malta, the man who led the search. Speaking to The Sunday Times of Malta, Prof. Gambin said the exhibition was not the end of the years’ long excavation and research. Over the coming years further information and more artefacts would throw additional light on that period of the island’s history. Gozitan historian George Azzopardi said this was no ordinary exhibition. There were at least two reasons why this archaeological discovery could be called a ‘treasure’, said Dr Azzopardi. “One is its massive size.